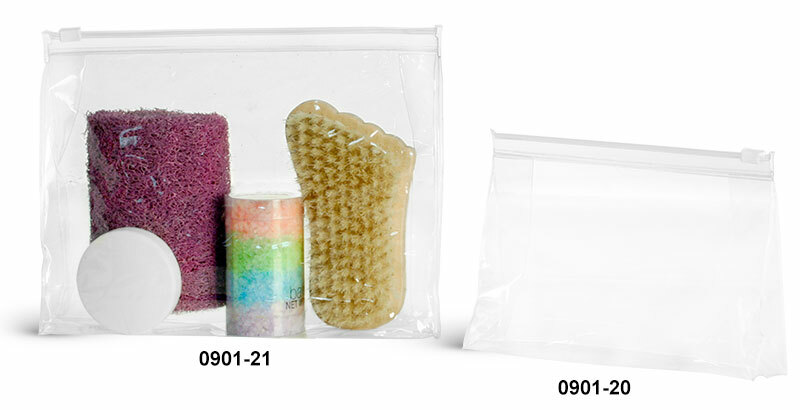 These clear vinyl bags are available in two sizes with convenient zipper slider closures, keeping the bags securely shut. Choose from 0901-21 & 21B for natural zipper sliders, or 0901-20 & 20B for clear zipper sliders.. These plastic bags are composed of strong 6-gauge DPC vinyl with heat sealed seams for extra durability. Vinyl bags in each size can be useful in holding travel size toiletry containers, sample size products and more. Note: bags come empty; contents shown in picture not included.